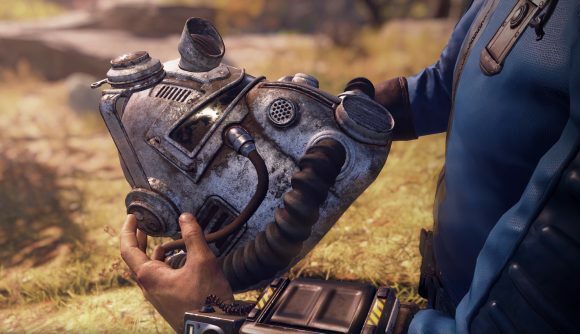 It looks like Fallout 76 will have ways to penalise you if you die with a bounty that you’re unable to pay. Specifically, your PvP damage will be reduced – by as much as 50%, according to reports on Reddit. Fallout 76 will let you fight other players in PvP, but you’ll only be rewarded if they opt in to the system. If you kill someone who doesn’t want to fight, you’ll be deemed a griefer, and will be marked with a bounty. Other players can claim that bounty by killing you, and should they do so, their prize is paid out of your own purse. With the Fallout 76 beta having gone live on Xbox already, more details are trickling out. TommyBoyTC says on Reddit that he “accidentally” stole a player’s item while looting a junkyard, and got slapped with a 30-cap bounty (so theft is also a punishable offence). He had only five caps, so when the bounty was claimed not long after, he was technically in debt by 25 caps. Tommy reports receiving “an active effect that reduced PvP damage by 50% for four hours”. Apparently its name made reference to his debt. As is understandable in a game about scavenging from public territory, it sounds like claiming loot for yourself is an involved process. Another comment on TommyBoy’s thread says you need to use the CAMP machine to physically build a lock to protect public workshops that you’ve captured, or else any turrets you’ve built to defend them won’t fire. This is anecdotal for now, but the Fallout 76 beta goes live on PC tomorrow, so it won’t be long before we can see for ourselves. Some sort of system to punish debtors seems like an important feature, and hitting PvP damage is surely appropriate for those that have been griefing. For all the latest details about Bethesda’s MMO experiment, here’s everything we know about the Fallout 76 release date, gameplay details including perks and stats, where it fits in the series’ timeline and how Bethesda have retconned in the Brotherhood of Steel, system requirements, and plenty more.